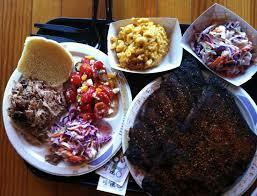 Knoxville is home to some of the most delicious restaurants! Here are some of our favorites only the local know about. King Tut’s Grill is one of the oddest restaurants you will ever go to. Not just in Knoxville, either. The owner, Mo, is endearing in a harmless, crazy uncle sort of way. Depending on how the mood strikes, you could be walking into a disco, a karaoke bar, a romantic escapade, a combination of all of those or an Egyptian restaurant. And, all are great options! 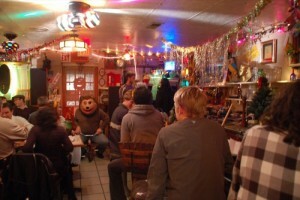 Mo, the owner, is a gracious host and it’s always a great time! The middle Eastern specialties are delicious (and a safe bet). Definitely call ahead-Mo sometimes closes if he’s bored or the mood strikes. More info here. 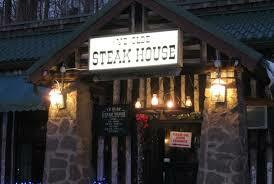 Despite the cheesy name, Ye Olde Steak House racks up “Best Steak House” awards each year. On any given night there may be folks from 20 states dining in the log cabin themed restaurant. For more than forty years Ye Olde Steak House has been serving the best Iowa grain-fed beef along with fresh salads and traditional steakhouse sides such as baked potato, wedge salad, and southern style dishes like green beans and broccoli casserole. The steak house has become especially well known to University of Tennessee Football fans. It’s on the list of the 100 Best Things about Tennessee Football and the 100 Best Secrets of the Great Smoky Mountains and one of the ten best steak houses in America. If you want a great steak in a casual atmosphere you need to check out this place. Click here for their website. Love that BBQ occupies a former convenience store in the historic Vestal neighborhood and is a a short drive just South of Downtown Knoxville. 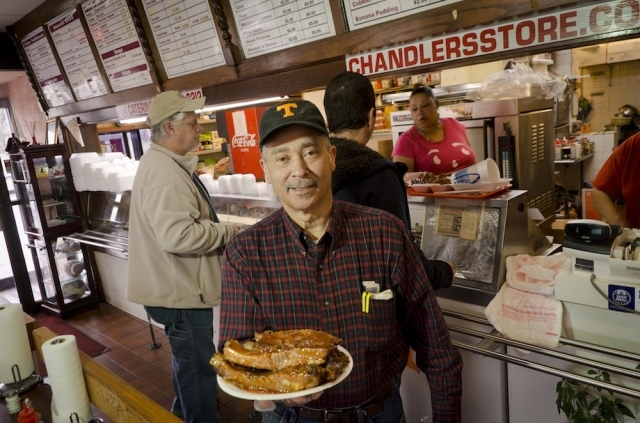 Walter Love (yes, that’s his real name) cooks up some of the most amazing BBQ this side of…well wherever. Mr. Love cooks up brisket, chicken, and pork right outside the restaurant. The desserts sides are amazing too-potato salad, fries, 7 layer salad, they’re all great. But, the hushpuppies are out of this world! We’re going to let you in on a little secret-Tuesdays and Thursdays are banana pudding day. But love That BBQ goes the extra mile and instead of vanilla wafers, they put Nutter Butter cookies in the pudding and yes, its just as decadent and delicious as it sounds. Click here for their web site. Located in an old building that once housed a Taco Bell Chandler’s Deli is all about the southern cooking. Don’t let the name fool you-this is not a sandwich shop. This is real Southern cuisine at its best-fried chicken, ribs, BBQ pork, collard greens, fried green tomatoes, okra, and some of the best mac ‘n’ cheese you’ll ever eat. It may not be the fanciest place you’ve ever eaten, but it WILL be one of the best. Click here for their website and menu. Few chains inspire such love and devotion as Dunkin Donuts. 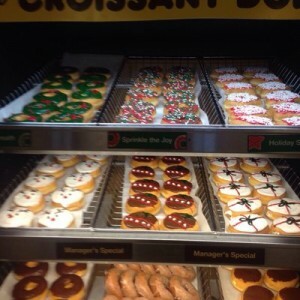 From the coffee to the Donuts, to the breakfast sandwiches, people love Dunkin Donuts. Thankfully, we have one that is a six minute drive (or a 20 minute walk) from downtown at 2800 Chapman Highway, 37920.